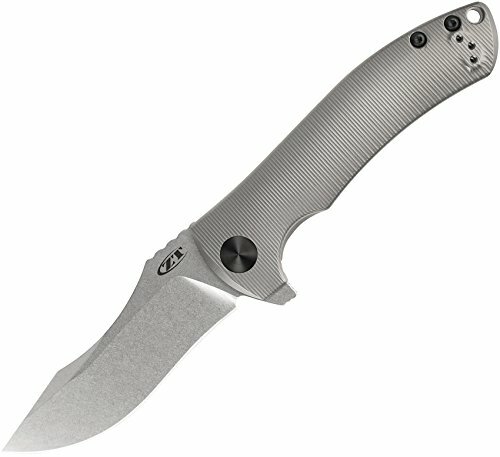 Designed by custom knifemaker, Les George, and premium-built by Zero Tolerance, the cleanly built ZT 0920 is a powerful folding knife skillfully crafted in the USA. Constructed for strength, durability and optimal performance, it’s the ideal knife for any outdoor activity, household task, slicing or the gentleman’s everyday carry. Regarded as a “super steel,” the CPM 20 CV stainless steel blade with a scooped spine, top swedge and slight recurve for cutting versatility offer outstanding edge holding capability and corrosion resistance. Completely 3D machined titanium handles with bead-blasted finish allow the knife to be very strong but very comfortable in user’s hands. The 0920 is sleek with bronze-anodized aluminum tube spacers and bronze-anodized bent titanium reversible pocketclip for tip-up carry. The KVT ball-bearing system is remarkably fast for manual opening with the built-in flipper. A titanium frame lock with hardened steel lockbar insert secures the blade open during use.